The design phase is where the tires hit the pavement on most projects. The usual work products involved in any I.A. engagement include those described and pictured below. I've used various forms, templates and formats over the years. These represent my most recent approaches. 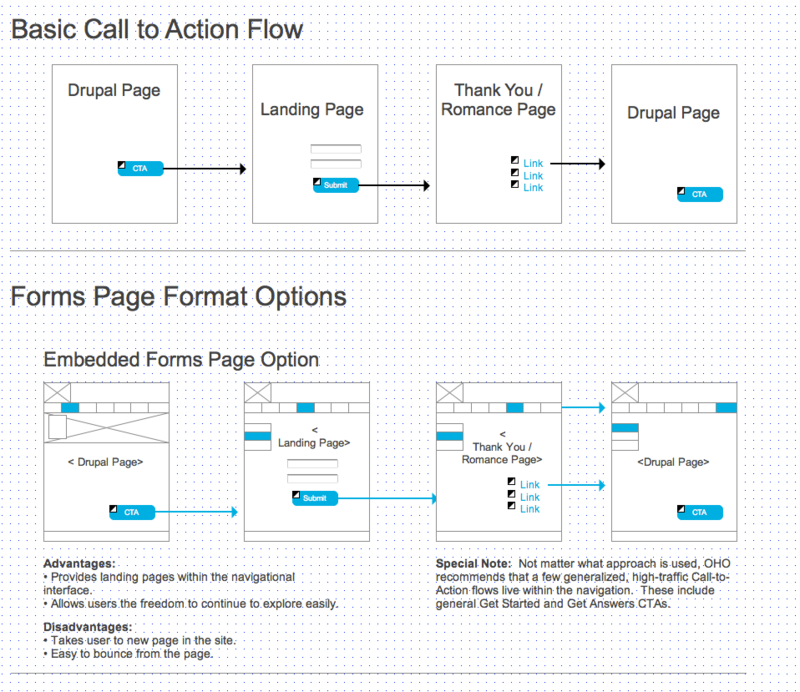 Basic User Flows: Process flows documenting the page accesses involved in a basic CTA - Thanks process. A final set of process flows are often necessary before the I.A. can begin creating the site map and wireframes. These usually include only the most important process that can be completed on the site or on the app. Documenting all the process would be much too time consuming and would not be worth the investment. There are a number of different approaches to producing these process flow charts. Often they resemble old Visio-type figures with boxes and arrows and circles. I find it useful to include small screen/feature representations when creating my process flows. 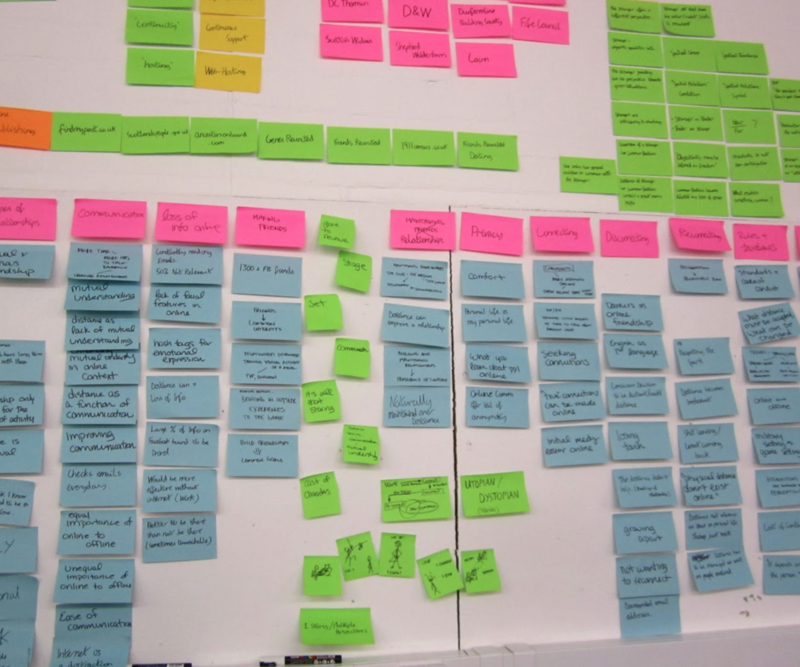 Sorting & Affinitization: Post-it notes are great when you are aligning features and functions into organizational structures. I usually conduct Sorting & Affinitization exercises with team members before I begin forming a site structure. I have stakeholders use Post-it notes to create site features and functions. Then I ask participants to help me organize the feature and functions on a white board. This helps all team members visualize the site structure. This affinitization slowly begins to resemble the navigational features and organizational structures on a website. Site Map: This is a site map I created for a large, nationally recognized, multi-campus university. From the exercise outlined above it's a hop, skip and a jump to creating the project's site map. My site maps usually outline not only site structure, but they include information on templates used for each page. I also try to visually indicate each component's functional relationship with other pages that are included in a process. Unique page identifiers are included and are documented in the Functional Specification, Use Cases, and QA Test Plan documents. Wireframes: I create my wireframes using Axure. I find that its prototyping ability allows me to create a workable version I can show to clients and test with customers in the same amount of time it used to take me to create flat wireframes. The Axure interface is pictured above. For years I created my wireframes using a design tool such as Illustrator, Photoshop and even PowerPoint. None were particularly useful when you had to show how the interfaces actually worked on a browser window or in an application. A few years back I began using Axure to create my wireframes. Not only is it an easy tool to master, but it also allows me to create prototypes on the fly. 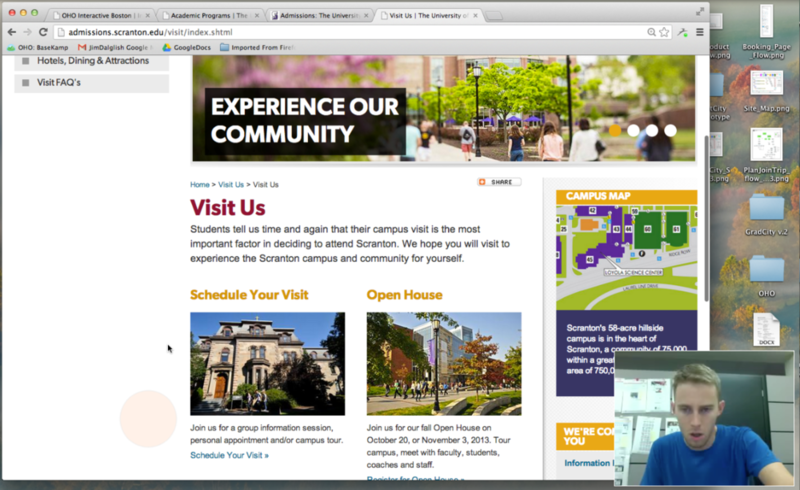 All I have to do to test my designs is to click a button and Axure generates a working prototype in a browser window. Links are active, roll-over states are visible, dynamic panels are working and navigational features such as drop-downs, radio buttons and sliders can all be up and running. Another huge benefit is Axure's specification generation tool that will allow you to create a functional specification quickly and easily. Usability & Prototype Testing: I use Silverback for desktop testing and UX Recorder for mobile testing. Creating my wireframes in Axure allows me to use my designs to perform quick prototype tests. I can even add some design elements in order for it to look more like a real website or application. I usually test my designs against the client's leading competitors to make sure that we are beating them on a feature-by-feature basis. The creation of the Functional Specification is the last I.A. step before handoff to the graphic designers, UX designers, developers and QA personnel. The document should contain the Site Map, User Process Flows, Taxonomy/Nomenclature, Annotated Wireframes as well Technical Recommendations on a feature-by-feature basis.